Confession: I have a long love affair with earl grey-infused desserts. This cake is the result of my attempt to give into this love, while also going against the grain by NOT creating one of the obvious fall season treats that are already flooding the food world at the moment (let’s see when I will fail) :p. As with anything tea based, the key to making the flavour work is a reverence for the brewing process. Your focus should be on drawing out the full-bodied flavour that lies within. And being a British tea, this choice of flavour can make for the perfect afternoon drink, as well as the ideal naughty snack. As for the cake itself – with its own inherent citrus undertones, the Earl Grey in this cake is ideally accentuated with the addition of fresh lemon juice and zest. On the other hand, throwing in cream cheese is a new idea, as the taste of the first version of this cake was lacking vibrancy, something which I reckon a great cheesecake should possess. When this is then mixed with mascarpone cheese, you get a superbly rounded flavour packing creamy sweetness and multiple layers of sourness. But that’s not all. Did I forget to mention the finishing touch of fresh figs and drizzles of extra honey on top? All this together, well, it’s a rich, vibrant kick of elegant floral flavour in every bite. In terms of process, just like other cheesecakes, this cake requires a water bath while baking to prevent the cake’s surface from cracking from the heat. Also, it has to be baked at a lower temperature to allow for even heat distribution. This is not a short bake and, I know, I hate to wait just as much as every baker does. But again, patience is the key to everything. How about watching your favourite show on Netflix as you wait? Hope you will enjoy this recipe :)! Line an 8-inch cake pan with parchment paper. Ground the graham biscuit into a semi-fine texture with some crunch left using a food processor or blender. Add the melted butter and mix well. Evenly distribute the mixture across the bottom of the pan, before pressing it with a spoon until a firm and even based is formed. Add milk and earl grey tea leaves into a saucepan, bring the mixture to boil and mix well. Turn off the heat and let the flavours develop as it cools and then set aside. Add mascarpone cheese, cream cheese and honey to a large mixing bowl. Using an electric mixer, mix the ingredients on a medium speed until evenly blended and smooth. One at a time, add eggs to the cheese mixture, mixing at a medium speed until all five are well incorporated. Add salt, vanilla, lemon juice, zest, and the cooled earl grey milk to the mixture and incorporate gently using a spatula. Finally, sift in cake flour and mix well. Take care not to over mix – the texture should be smooth. Pour the completed batter over the base in the pre-prepared cake tin. Bake the cake in a water bath (e.g. a larger pan with hot water inside) at 320F (160C) for 20 mins. Then lower the temperature to 240F (120C) and bake for 90 mins more. When time is up, open the door slightly to let the cake gradually cool down in the oven. Once cooled, refrigerate for at least 3 hours. 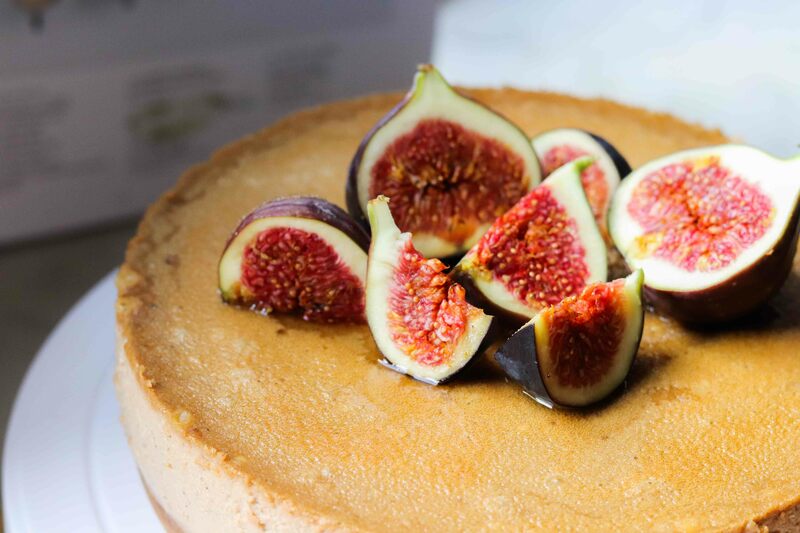 Lastly, decorate the cake with fresh figs and honey. Enjoy! I am Charlotte. Welcome to my culinary world, where no whisks are too big to take, no flavour combinations are too weird to try, and no nuts are too hard to crack.